MyTinySun Head 1000 Pro Head-torch £253.96 « Shuffling Along . 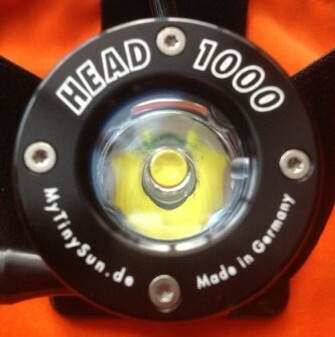 . . . .
MyTinySun HEAD 1000 PRO 1000 lumens! It’s taken me long time to write this review as I like to give my honest opinion on everything I test and feel this just isn’t possible after just a quick run. I’ve used this light in runs over 100 miles and in all conditions from -10 temperatures, wind, snow, rain & just about everything in between. I’ve charged it loads of times and given it the usual abuse most of my kit gets in hard use. Up to now its stood up to it all very well, this is partly due to the sturdy box it comes in which is handy for drop bags as it stops the light getting battered around in your bag travelling to and from events. If like me you’d never heard of MyTinySun they’re handmade in Germany by a small company with a strong reputation for building very high quality lights. As soon as I opened the box I noticed the way this thing is made, it’s not like most mass-produced head torches on the market. The main components of the light are aircraft quality aluminum. The slight downside to this is that the full light with battery weighs in at 301g which is about double what my old Petzl Myo RXP weighed. This is however not the full story as the actual headlight can be separated from the battery by a wire, this means the battery can be placed in a pocket leaving the headlight which only weighs 197g. This is about the same weight as the Petzl Myo with 3 AA batteries. The light comes supplied with a 70cm extension cable, I use this wire to put the battery in the pocket of my UltrAspire KINETIC backpack which it fits perfectly, it’s smaller than the battery pack on the Petzl. The battery can also be fitted to the back of the light in the conventional way. The battery is made by another German company and uses the Open Light Systems battery, 7.2V 2.9Ah. Giving a full power maximum run time of 1hr 53min. At 220 lumens run time is 13 hr 55 mins. Other sizes are available for the light including a 5.8Ah battery which gives a maximum run time of 3 hrs 47 min at max power of 960 lumens & 27 hrs 50 min at 220 lumens. These really are excellent run times for such a bright light. I recently did a race over 100 miles with a friend using a new Petzl Nao & his light went out after 3-4 hours in the sub-zero temperatures. The MyTinySun lasted all night on low, about 220 lumens which is brighter than most head torches on full. The light has 2 main modes of operation – Simple (very easy to use) this has 3 light levels and Expert, with 6 modes and too many light levels to go into here as it would take up the rest of the review! (for the professional user). Also SOS mode, 2-level emergency light and a 4-level battery indicator, using the illuminated switch on the side of the light. This changes colour to show battery condition, going from green to red depending on battery level. The light can be either used as a simple turn on and go or completely customized to meet the needs for any event & run time. It even comes with a full set of Go-Pro mounts for mounting to a bike helmet etc. The MyTinySun also comes with 3 different lenses which are interchangeable for different beam patterns. These are the one on the light when it comes which is a great general purpose (long throw) lens. Then you have one which is good for narrow trails where you don’t need the long throw and just need a narrow tube of light & a wide dispersed beam which is ideal for walking where you don’t need the throw and just want a broad pool of light. This is also ideal for around camp and general use. One thing worth noting is the light doesn’t come with a tool for removing the lenses. These can be bought for around £2 from Halfords. I’ve tried all the lenses and they all work well, most will find the lens which comes fitted as standard will be right for the majority of running. It’s always nice to have the choice though. The headband and the weight can hardly be felt in use. I forgot I had it on once & left a checkpoint wearing it when I should have taken it off! The headband is much wider than on the usual headlights so it spreads the weight better. 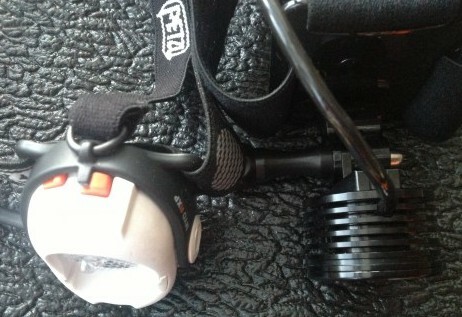 It also has lots of adjustment, I find most headtorches have to be fully extended to fit my large head. The problem with this is I end up with the battery box sticking in my head. I managed to fit this one no problem with lots of room to spare. The head strap also has some rubberised lines embossed onto it which stop it slipping around. Also a good thing if like me you sweat a lot. I sometimes wear a hat at night & it stops the light from moving around. The headband is big enough to wear a hat underneath. The light is adjustable via a large thumbwheel on this side which is easy to adjust even wearing thick gloves. If you have a Go-Pro camera this will be familiar to you. 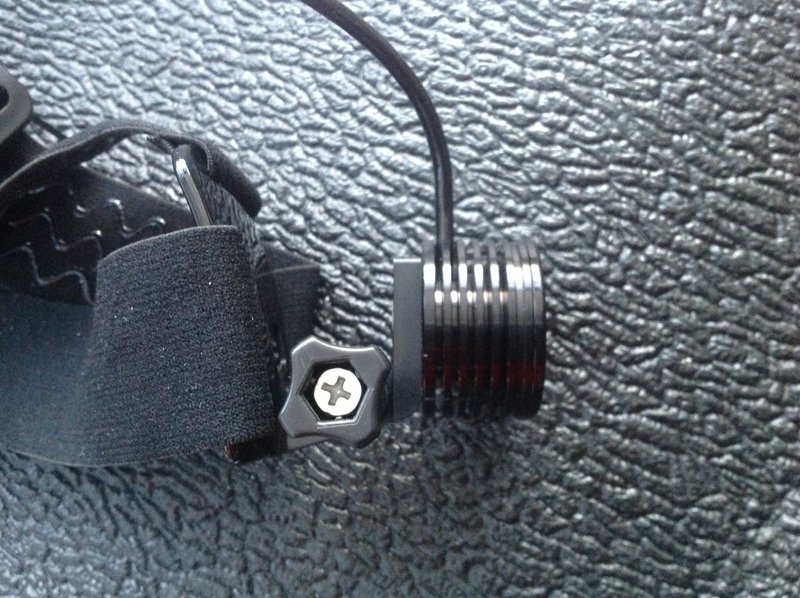 It’s well made and locks the light in place securely once tight. It never moved once in place, even when I hit my head on a low tree branch. Another useful feature is the light built into the on/off switch which gives the battery status and you can have it slow flashing. 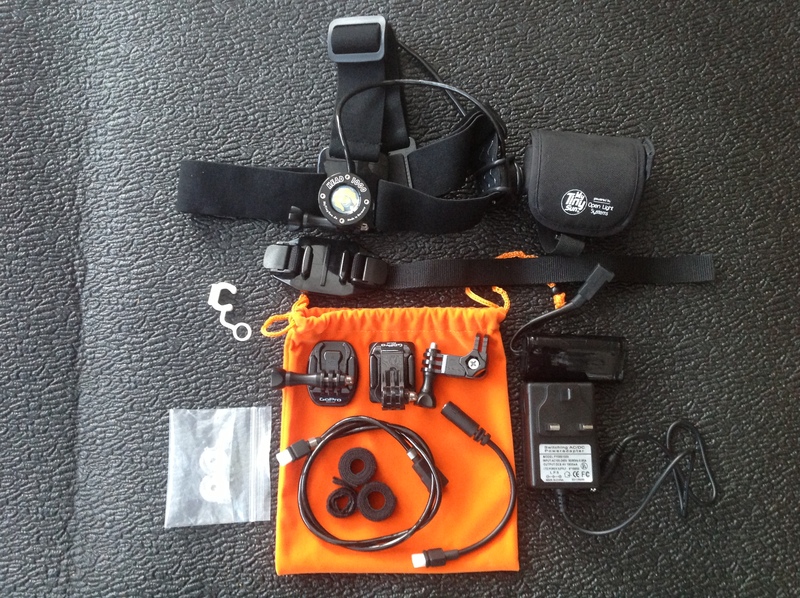 This is useful for finding it in your drop bag at night. This feature can be turned off to conserve battery if need be. The battery on the MyTinySun is smaller than the Petzl & easily slips into a pocket. It’s no big deal to carry two of these if you need to but with the light on 220 lumens (low setting) you should never need to. I found myself using this setting most of the time. The quality of the lens is so good it’s plenty enough to run with. You can always switch to 960 lumens for technical bits where a lot more light is needed. The Open Light Systems battery, 7.2V 2.9Ah contains 2 18650 batteries which are much more powerful than a standard AA battery & give very good run times as a result. All the fittings are really good quality & most are readily available from Maplins if you ever need to repair the light. Something which can’t be said of the majority of things these days. The light does come with a very comprehensive 2 year warranty though and is upgradable if a new LED comes out. The light comes with the latest Cree LED XM-L U2 & the software inside the light is upgradable, so if an update becomes available you can add it to your light. An option is also available to add even more features to the light including automatic activation when it goes dark and SOS if it detects a jolt from a fall! As you can probably tell I’m impressed with this light, very impressed. So what’s the catch? Well the not inconsiderable cost of £253.96 at first seems like a lot to spend on a headtorch but if like me you’ve tried most of the ones on the market & just want the best light money can buy then look no further. This is your light, it’s the best light currently available bar none. I tried it next to the Petzl Myo RXP & you couldn’t see the Petzl’s beam even with the Head 1000 on low (220 lumens) The last few events with this light I’ve been asked “where did you get that light from?” It’s that bright it drowns out the other head torches. I’ll try to get some pictures posted of the light from it, as soon as I get some time. 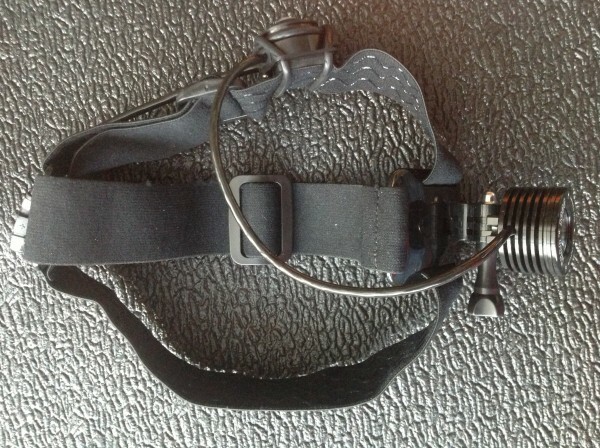 GoPro spare parts grab bag to allow complete versatility of mounting options. let me think. . . . . . . nothing! If you have any questions or comments about this light please post them below & I’ll do my best to answer them. Great review and very helpful. I’m nervous about2 things; 1. The price and 2. The battery options. Do you need to purchase non-standard batteries for the longer burn times? I plan on using this in 100 mile trail races including the west Highland Way Race and Lakeland 100. Will it last these events in standard guise or will I need to spend a lot more on extra/bigger batteries. Also, whilst this is clearly an amazing torch for trail running at night, is it over egging the pudding? Is the extra weight worth the extra vision? I currently use a nextorch (£30) at night which allows me to trail run, but maybe I don’t know what I’m missing? First, yes the price is BIG but it should last a lifetime and it’s upgradable. How may lights can you say that about? It will also take the abuse which many of the plastic lights wouldn’t. I’m pretty rough on my kit & just treat stuff like this as a tool to get a job done. I’ve left it in kit bags, dropped it onto stone, been in all sorts of weather on mountains & it’s come out of it all still working. If you compare it to something like a Petzl Nao at around £130 it looks like great value as the Nao has only a single 18650 battery inside & the 1000 has 2x 18650’s. Petzl also charge £40 for each spare battery. When a new LED comes out it becomes obsolete. Another point to add about value which may or may not be of interest to you, the 1000 can be used as a bike light. I use mine with the supplied Go-Pro mount on my bike helmet and it’s great for night rides. It can be mounted on the handlebars with the supplied kit to. The second point about the battery. It will last the full West Highland Way Race and Lakeland 100 on the battery you get with the light. You may need to program the light onto one of the lower modes but it will last. You could use the standard battery to get 220 lumen’s run time for 13 hours 55 minutes. But with easy mode & expert mode you should be able to find one to suit every race. 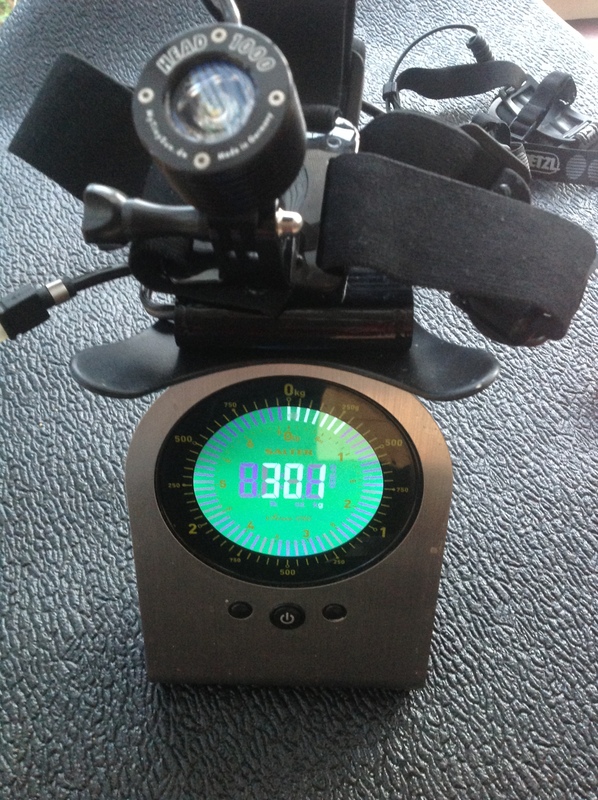 The weight on the head is less than a lot of other lights at around 197g, the battery can be in a pocket on your pack. Good luck in both the West Highland Way Race and Lakeland 100. If you do ring about the light please mention this site. Hope that’s answered your questions Keith, if you have anything else to add just ask. Thanks Colin, I purchased one on the basis of your comments and I have to say it is one of, if not the best bits of kit I own. I haven’t been brave enough to delve into expert mode, it i don’t think ill need it! Simply the best headtorch money can buy. That’s great Keith, hope you enjoy it. Well, 2 months on and the Mytinysun had been faultless. Until last night. I was out on a long run in the dark, fog and rain. I was only about 6 miles in on low power (220 lumens) and the light went dead. The battery had been fully charged. After getting home I charged it again, and when I connected it the lamp (and control button light) flashed on then off. I have been in touch with MAgicshine and await a solution. I’ll let you know. Any problems with yours? No nothing as yet, I’ve been using a different light though over the last month, due to needing a light with power to last all week. It’s been fine though up to now, even in the worst weather. Let me know how you get on. Well, after 2 months of superb service, my headtorch failed on a foggy trail run in the woods. It appears to be a battery issue and Magicshine have shown exemplary customer service in immediately sending a new battery to try out. They were slightly shocked as they haven’t had any problems before! I will let you know how I get on, but their initial reactions have been second to none. Thats great news, hope it works out for you Keith. Bonita from Magicshine was very helpful and replaced the battery, which rectified the problem. I will also now routinely carry a spare….just in case. Being that it is a German light I assume it doesn’t have a flashing setting? I spotted that you had a count down to the spine. I hope it went well for you as I new a few people on the MS Teams out there. I was hoping to try myself but work got in the way and looks like it will next year!! looks like it will be 2017. Anyway, I was wondering if you used the MTS 1000 for the event and if so how did it perform re battery time etc? Yes it went well, I finished & no injuries so I’m happy with that. I didn’t use the MTS 1000 but I did use a 18650 powered light. Will do a review of it soon. I had limited recharging options on The Spine so the MTS wouldn’t have been suitable for the week long event.